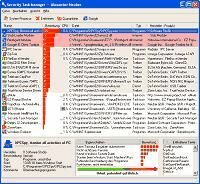 Avira AntiVir Removal Tool for Windows is a free, easy-to-use disinfection tool, specifically designed to remove a series of security threats from your system: - Worm/Sober.J - Worm/Sober.P - Worm/Sober.Y - W32/Stanit.A - Worm/NetSky.AA - Worm/NetSky.B.1 - Worm/NetSky.C - Worm/Netsky.D.Dam - Worm/NetSky.P - Worm/NetSky.X - Worm/Mytob.IN.2 - Worm/Mytob.KS - TR/Spy.Banker.AATZ - TR/Spy.Banker.AATZ.1 - TR/Spy.Banker.AATZ.2 - TR/Spy.Banker.AATZ.3 - TR/Drop.Agent.qna.2 - TR/Drop.Agent.qna.1 - TR/Agent.imh - TR/Agent.its - TR/PSW.Delf.AH - TR/PSW.Kates.C.25 - TR/Spy.Delf.tge Main benefits: - Repair affected files, whenever possible (sometimes files may be irremediably damaged by the malware's actions). - Easy to use: you do not even need to install it, just unpack it and use the operation instructions provided in the readme file. - Constant transparency: it displays information while scanning files on your computer, thus allowing you to know the live status of its activity. - Report features: this tool is able to create log files and reports after completing its task, providing information on scan results. - Continuous development: we recommend you to check regularly for the latest version, as our virus researchers will add more detection routines to this tool, in order to remove even more threats.